The Ideal Solvent for Thinning GOLDEN MSA Varnishes Do you find yourself having to search for a compatible solvent for GOLDEN MSA Varnishes? Well, with GOLDEN MSA Solvent, things just got awhole lot easier! As other solvent manufacturers change their formulas to comply with legislative restrictions it.s becoming harder to locate a compatible solvent for our MSA Varnishes. With GOLDEN MSA Solvent, you now have access to a competitively priced solvent designed especially for use with our MSA Varnishes. Travelling from store to store to find what you need is no longer necessary. MSA Solvent can be purchased right in the art store on the same shelves as the rest of our materials. And don't forget, MSA Solvent can also be used for tool and paintbrush cleanup as well as for removal of MSA Varnish at a later time for restoration purposes if necessary. GOLDEN MSA Varnishes can be used over a wide variety of paints, including acrylic, oil, alkyd, egg tempera, watercolour, and casein. Suitable for interior or exterior use MSA Varnishes provide protection against the harmful effects of ultraviolet radiation, as well as reduce the susceptibility of the painting due to dust, dirt and marring. 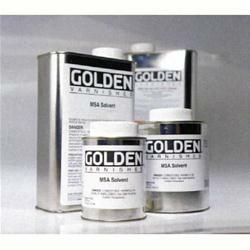 Golden MSA Solvent 8 oz. Golden MSA Solvent 16 oz. Golden MSA Solvent 32 oz.